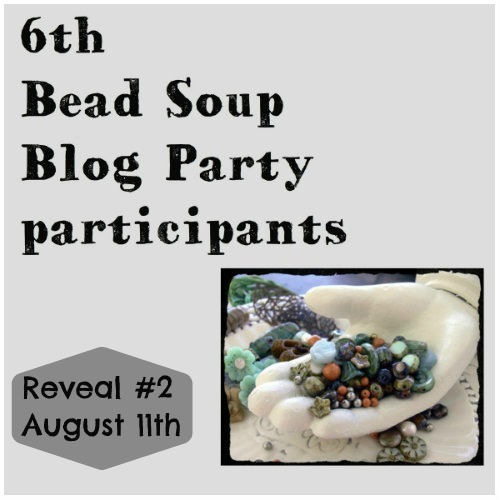 Welcome to my first time at the Bead Soup Blog Party! This was a challenge and a blast as I spent a few days way out of my comfort zone working with the lovely pieces that were sent to me by by Bead Soup partner B.R. Kuhlman. I started with the wire-wrapped polymer clay focal. 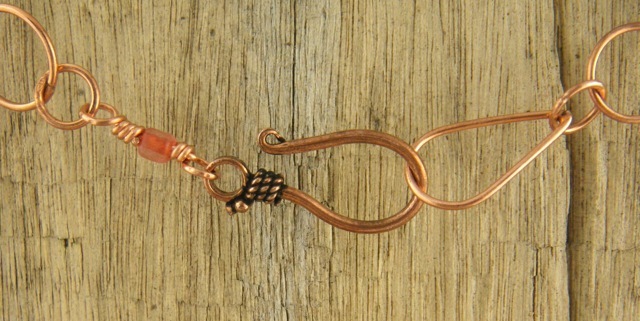 I was so pleased to find I had copper chain on hand that totally complimented the copper hook that B sent me. I strung and restrung the center of this necklace, trying to make it work with a strand of peach colored silk. It wasn’t until I got out some leather cord and did a little wire wrapping of my own (many attempts!) that the piece came together. I made the copper clay leaves a few years ago and they seemed the right weight to balance and frame the focal. The dotted beads are dyed bone from Africa. 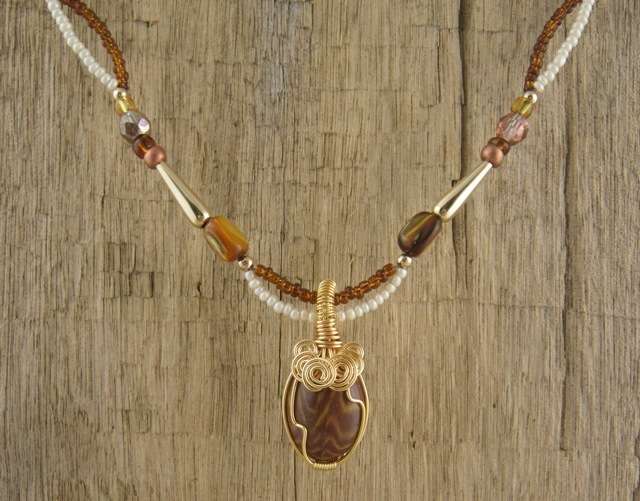 Next came the Zebra Jasper wrapped in gold plated wire. I wanted to keep the necklace pretty simple to highlight B’s beautiful work on the focal. 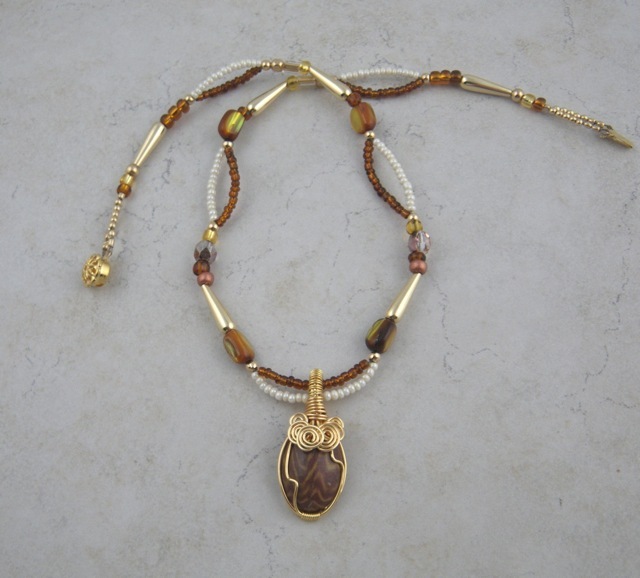 The gold box clasp she sent had 2 holes to attach strands of beads which influenced the necklace design. I totally missed putting these pieces of gold coral in my photos when I opened B’s package. After doubling the strands on the necklace above, I continued exploring the look when I made the necklace with the coral. After the third necklace I wanted to make a bracelet. I thought the brown ribbon tied around my package from B would be a cool way to connect the ends of a 3 strand elastic bracelet. I’ve never made anything like this before, but I will definitely keep an eye out for connectors like these in the future! With still more beads, I set about making some earrings. The copper and brass rings are links I cut from chain I had in my stash. You can see I continued my leather cord exploration. Since I was already in “crimp mode” with the leather, I tried out some gold plated Beadalon wire for the next two pairs of earrings. Last, but not least, did you notice that B sent two feathers in the “soup?” I thought I was being so clever to use them in the photographs, but I really didn’t imagine using them as part of my jewelry making journey. The next thing I knew, I cut them down to a smaller size and tied them up with a mess of square knots in my little leather cord. Thank you so much B for the beautiful beads, focals, and clasps. I stretched and grew as I worked with them, and it was a whole lot of fun. Thank you, too, to Lori Anderson. You sure host a great party! I hope everyone who visits my blog will take time to look at the blogs of the other participants. Don’t get overwhelmed by the number of us. 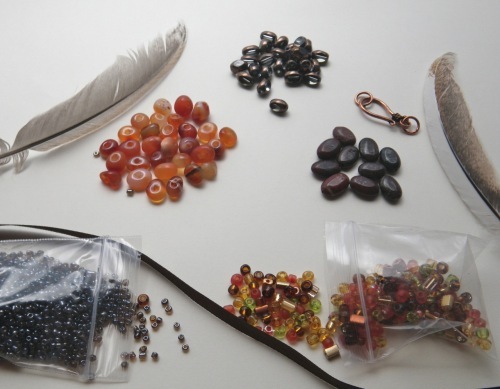 Just check out a few every day and explore the world of creative people who took the bead soup challenge! B.R. Kuhlman, Mixed Mayhem Studios My super duper Bead Soup partner!! Barb Fernald, Barbara S. Fernald Jewelry You are here! So many beautiful pieces! Love the bracelet!! 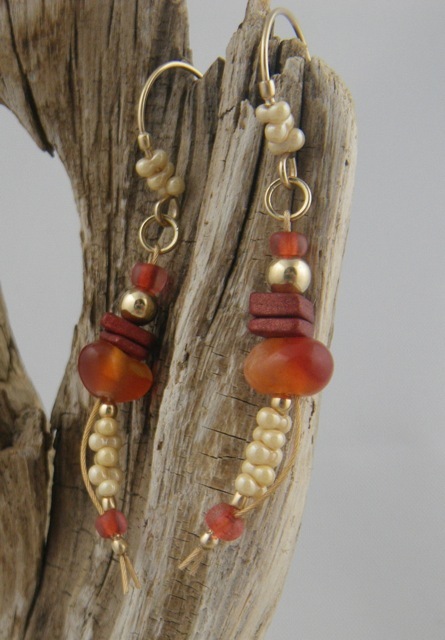 The coral necklace is beautiful and the stretchy triple strand bracelet is so clever. All your work is beautiful, but those pieces are amazing. Woa…you always blow me away with your designs!!! I love the multi-levels, if you will allow that term, to your necklaces! I, too, have never wrapped a briolette perfectly, but you seem to have mastered that, too! 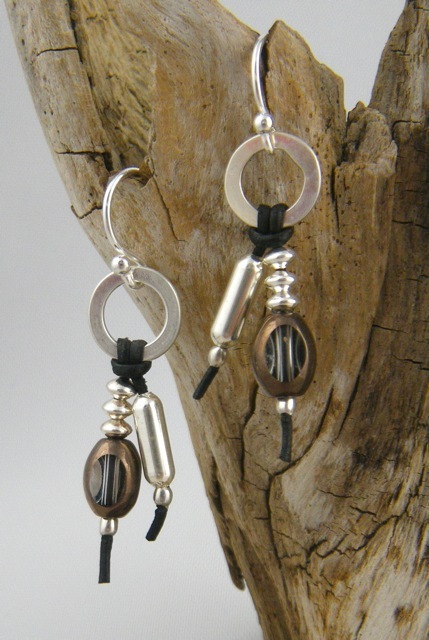 Your use of the leather…and crimping instead of knotting, is befitting your designs! Your use of the feathers is ingenius…everything is perfect! Well done!!!! Wow ! so many great designs. But those feather earrings are seriously cute !!! Love every single piece but the earrings are so much fun. Bracelet is gorgeous. Wow, so many amazing pieces. I really love seeing this new style of working for you. You’ll be thinking new approaches! Each piece is stunning! I love how you created each piece differently and with different elements – wonderful! 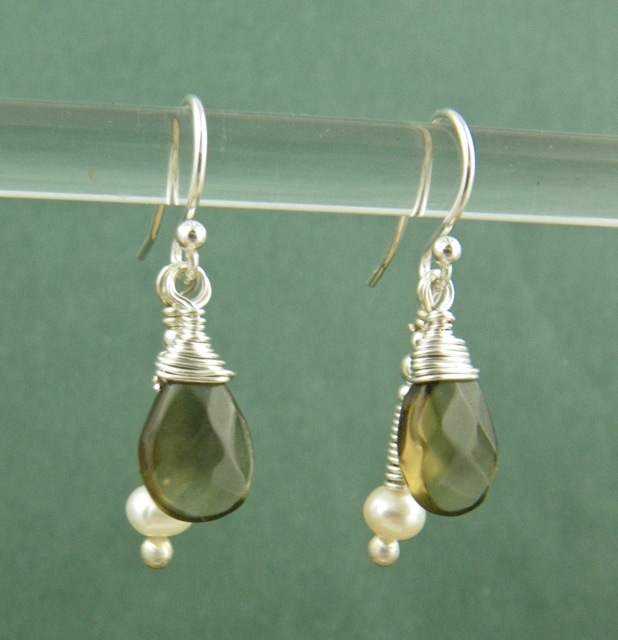 I hear you about wire wrapping – mom makes it look so easy – but you did an amazing job and way to stick with it! I love, love, love what you did with the feathers! You got a lovely soup and you made so amazing necklaces! The last pair of earrings is so cute! I love that you created so many pieces! Your wire work is great. :) Beautiful pieces, each and everyone. Awesome work! I really love all the earrings you made! I really LOVE the copper necklace! Will it be for sale?? Thanks Colette. Sure. Let’s e-mail. I won’t be getting anything up on my Etsy site this month. My summer schedule is crazy. Wow, so many pieces from your soup!!! The first part gives me a tribal-ethnic feel and I like how you combined the different components in your pieces. Good Lord Barb, You were busy! They are all so fantastic! I love everything you made! Thanks Sue! I really enjoyed this challenge. And I was challenged!! Have a great time at Beadfest. I know you’re busy too! 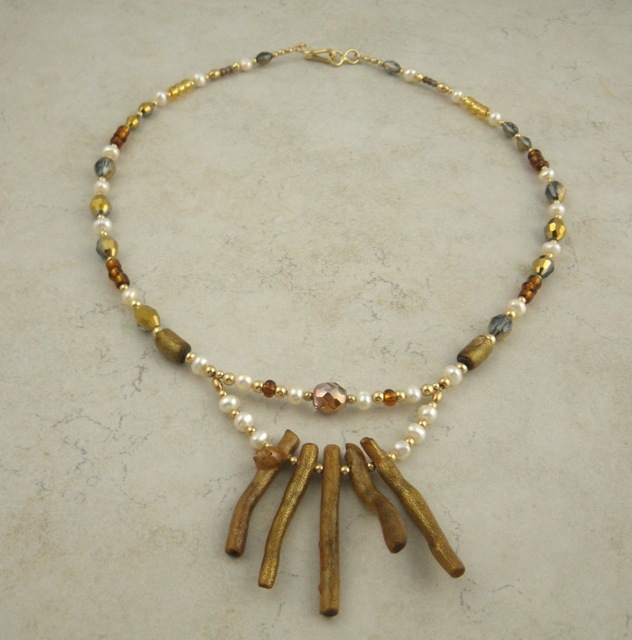 Oh my….You are very creative.All your pieces are very nice .I totally love the gold coral necklace. Gee…thanks for showing all of us up! LOL! I can’t believe how many awesome pieces you put together! I love tribal anything…so I can’t pick a favorite! Beautiful pieces, you did such a great job with this soup! I bow to you, Miss Thing. Just Fabulous!!! Aw, thanks Lisa. I just met up with Holly today and we all arrived on the 4:00 boat. Total fog, no view of the mountains. Holly’s husband Val stepped out on the front porch and said, “I already don’t want to leave! Thank you so much!” Islesford magic. See you in a week! 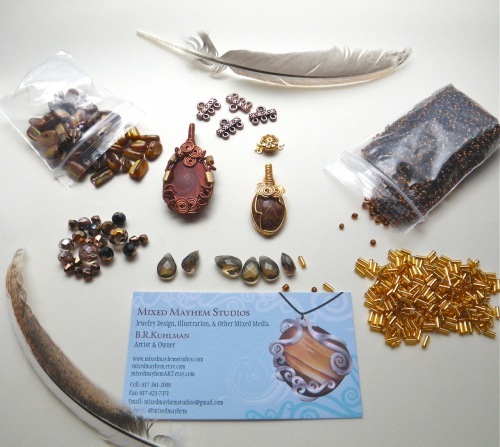 Wow – what an incredible wealth of beautiful pieces you made. 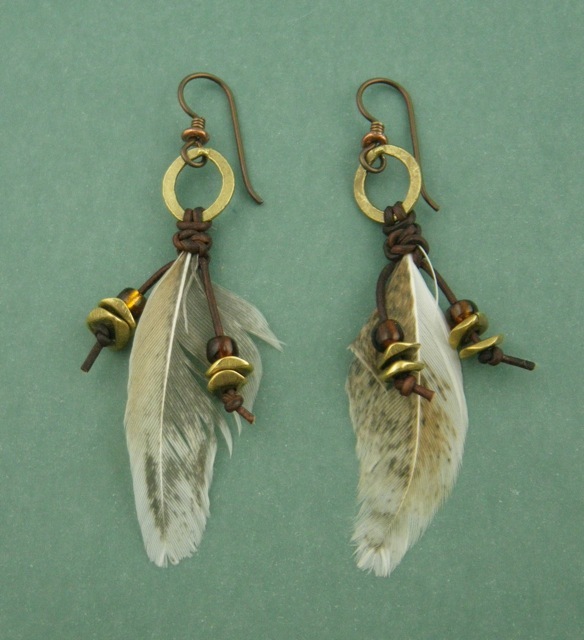 I love the feather earrings – such a great way to use them! Beautiful pieces. The focals are to die for. The little feather earrings are so cute. You did a nice job incorporating them with the leather. My favorite is that bracelet. I never would have thought to use those kind of connectors with elastic. I’ve only made one elasice piece, a watchband, but it wasn’t anywhere near your piece and talent. I love it. I LOVE anything dangly, and the gold corral is so neat. You did an amazing job and I’m so happy you joined the party and hope to see you again!!!!!! I don’t know how you do it Lori! This was so much more fun than I even imagined, and I really learned a lot working with something I had no part in choosing. Wow! Thank you for hosting this amazing blog party. I will definitely do it again!! You really got a lot of jewelry made from your soup. 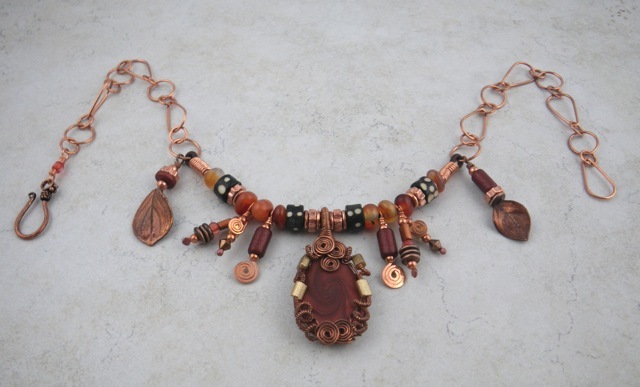 I especially like that first coppery necklace. It’s got both a bit of you and a bit of your partner in it. As well, your feather earrings are really neat. I like the textures you achieved in them! Wow! You were busy :) Love all your gorgeous designs. 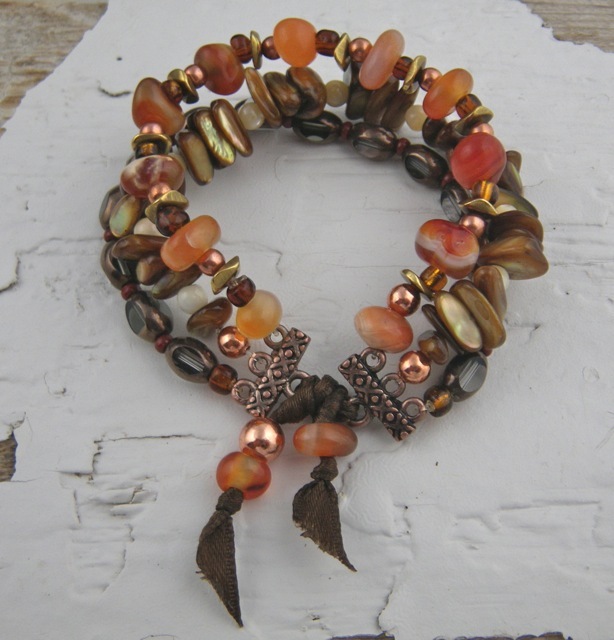 The three strand bracelet is gorgeous – beautiful earthy colours. Great bead soup! Boy, you made very good use of your bead soup! Everything turned out beautifully. I especially like the first necklace and the feather earrings! All gorgeous pieces! What a great soup you had with which to play. I love everything you’ve created for this challenge. You’ve used each and every bead to such striking effect, I simply cannot pick a favorite! The depth and movement of your pieces have me enthralled. I could stay on this post all day! I love all your pieces, especially the first necklace and the silver earrings with green briolette. You really seem to have fun and have an electric batch of items. I like how you used the two stands to draw the eye to the coral branches on that necklace. Love the colors and am in love with the first necklace. Wow you did a wonderful job with your soup, such great talent. They are all beautiful but I adore the necklaces! WOW, so much eye candy!! The 3rd necklace, the bracelet and the feather earrings are my favs! Great job making so much with your soup. So many lovely pieces! I love the feather earrings!!! Wow, what a great collection of jewelry! What amazing work! That first necklace still has me drooling. Wonderful!! I like all of your pieces but I like the first necklace the best. Beautiful work, I really appreciate how you blended the “soup” with your own style. Oh Wow! So many pieces! And they are all so beautiful and cool. wow, these are really cool designs..
Oh yea! Your work is amazing !! You had some great soup to work with and you made some gorgeous pieces with it. I really like your earrings with the Beadalon. I have never used it like that and I really like the way yours turned out. And, those feather earrings are wonderful. You should be very proud of your work. Great job! Wow! Incredible job with your soup. All your pieces turned out so nice. 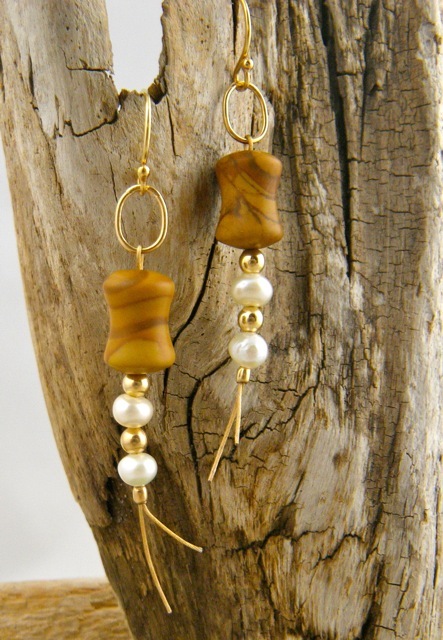 I absolutly love the use of leather on the earrings…I’ve never seen leather so thin…what size is the tan? Congratutaltion ! They are wonderfull works! Congrats! Amazing work! I love the first necklace and the feather earrings. Your use of leather and the beadalon wire is really interesting. I like it! Ever single one of your pieces are amazing. What a collection of wonderful pieces! You really made the most of your bead soup. I love that 3 strand bracelet btw, really nice! What a great collection of organic looking pieces! Wow, great job with your soup! So many pretty pieces! Love the coral branches, looks elegant and unusual. Great use of your bead soup! Love your work and design. Love your creations!! Wow…can’t decide which is my favorite, love them all! Nice job! I love the beautiful designs that you created with your soup. It is so amazing to see the unique designs by everyone in the party! Love it! wow, what a selection of soup. So many pieces & they’re all wonderful!! I love all your pieces. I especially love how you picked up the wire spirals in the first necklace, the black and silver earrings and those feather earrings. I’m so in love with the bracelet, and ALL the earrings! Earrings are a struggle for me, so I love a good design. Each one different, and so gorgeous! I think your wrapping looks great, and I’m going to try the leather bits, cause you made them look soo cool! Oh my goodness! I love absolutely everything you created! The earrings are so cool and I love that you created an elastic bracelet with those connectors and ribbon from the package. Your soup is inspirational! Oh my, I love them all! 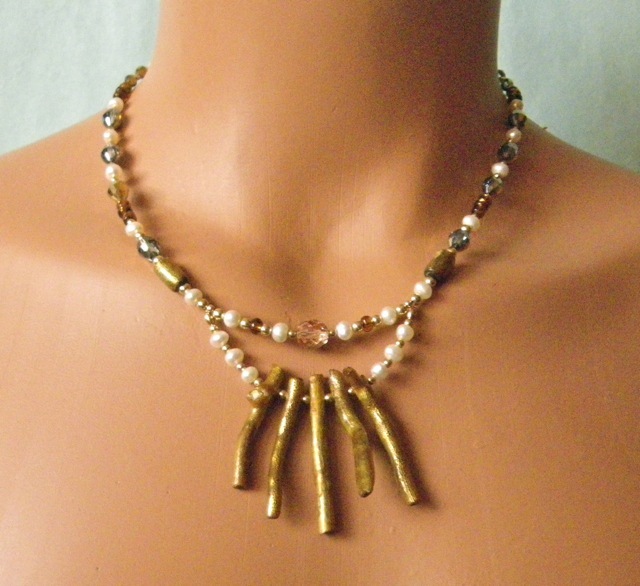 But I think my favorite is the necklace with the stick beads. So pretty!! Delicious soup! Your wire wrapping is AMAZING!! I am very impressed with your creations!! I’ll be following your blog from now on!! Hi Marci, I can’t take credit for the wire wrapping. That was done by my talented Bead Soup partner B.R. Kuhlman. She sent me the focal pieces all wrapped. Pretty amazing, eh?! Still hopping and responding! :-) Oh MY what beautiful pieces you’ve come up with! The first necklace and the third, and that gorgeous bracelet are my faves…but all are wonderful! Very cool soup you had! Love the feel and color combination of the pieces! Beautiful work! The first piece has an almost tribal feel to it! Wonderful use of your soup. 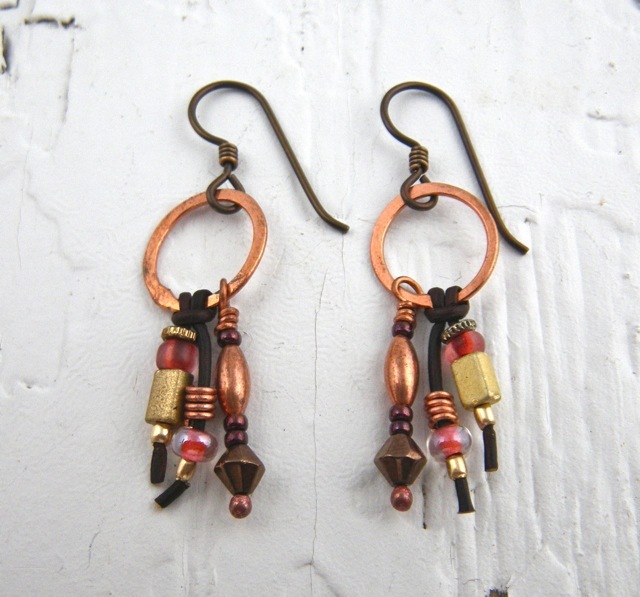 I can’t decide which piece I like the best all the earrings or the copper necklace. HMMMM I think the copper necklace wins, Love your collection!!!! Wow, very impressing what you made out of this soup!!! 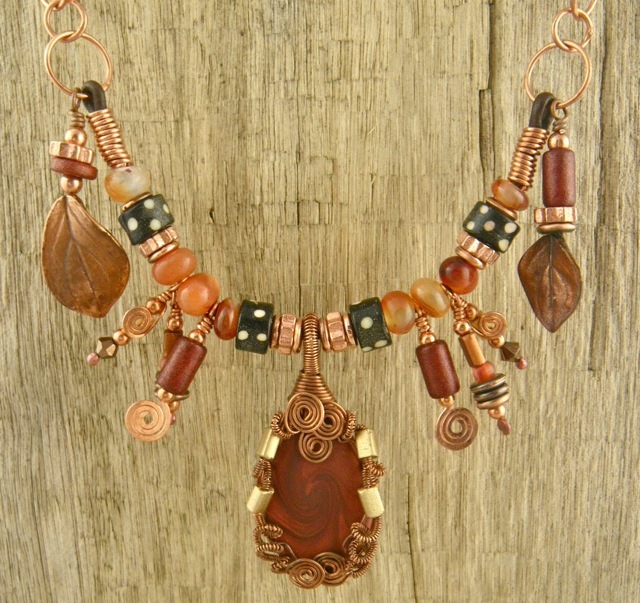 I love your first necklace with all the copper ingredients and the brown colors. But also all your other pieces are fabulous! Wow! All of your pieces are very creative.